In order to put (upload) a file on an FTP or SFTP server, you must have write permission for a folder on the server (that is, the permission to create, rename, and delete files). Most anonymous FTP sites do not give guests write permission, so you will probably need to use a personal account for this part of the tutorial. To upload a file to your FTP or SFTP server, first enter the hostname, username and password in the New Connection dialog and connect to the server. Then click the Put button in the transfer window toolbar. You will be prompted to select the file you want to transfer; since this is just a tutorial, you can pick any file, though you probably want to avoid very large files. The file put prompt also asks you to provide a name to give the file on the server, and gives you a chance to pick an upload format from a pop-up menu. Fetch almost always picks an appropriate name and format so you can simply click the Put button. You can select multiple files and folders to upload by holding down the Shift or Command keys when clicking on items, as you would in the Mac OS Finder. If you can see the Finder icon for the file you want to upload, another way to upload it is to simply drag the file's icon to the Fetch transfer window. 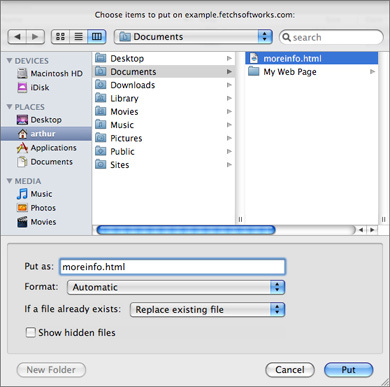 In that case, Fetch will use the upload format specified by the Remote > Format submenu and name the file automatically. The file will be transferred to the server and you will be able to watch its progress in the status pane at the bottom of the Fetch transfer window. When the transfer is complete, the name of the uploaded file will appear in the file list. If you do not want to leave the file there, select it and click the Delete button in the toolbar (or press Command-Delete). Congratulations — you have just transferred files to and from your Macintosh! You can learn more about Fetch by consulting the Using Fetch and Reference sections of the help.